So here we are, it’s part two of the Martini Chronicles. For years I had been under the impression that I’d had plenty of Martinis already. How come? Well, I used to buy that bottle of “Martini” they sell in stores, thinking it’s a ready-made mixture. Well, turns out that what was labelled as “Martini” was in fact just part of the brand name “Martini & Rossi”, which in fact is simply…..Vermouth. 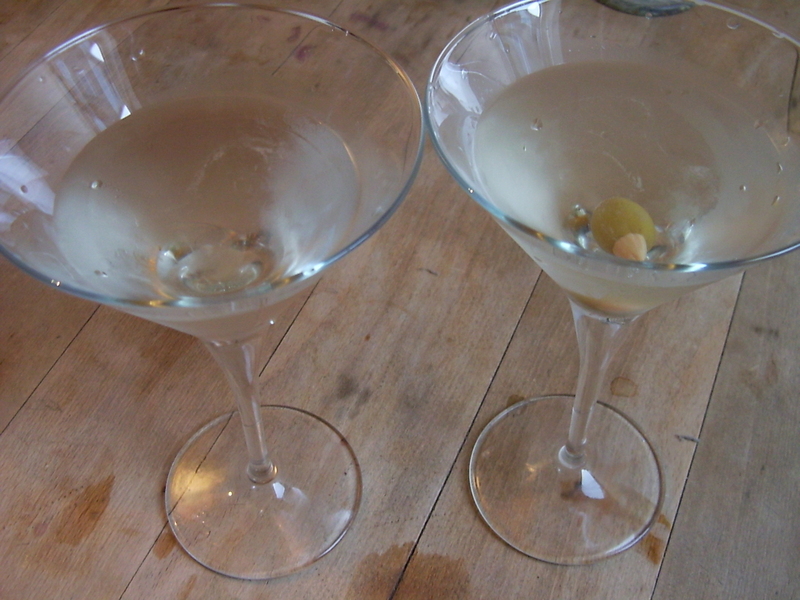 Yes, here it is, I’d been drinking pure Vermouth and thought I was drinking Martini. So you might be able to understand my surprise when I had my first sip of a real Martini yesterday. First I thought I had done something extremely wrong, but then it dawned on me, that yes, that’s simply what a real Martini Dry tastes like. But in the end, it really tasted quite good. Prepared the glasses by putting them in the freezer, for about five minutes. I think they could have been in a tad longer. Put five ice-cubes into the shaker (we only have elephant-shaped icecubes, but I think that doesn’t really make a difference. Or so I hope). I then poured five parts Gin and one part Dry French Vermouth (Noilly Prat) into the shaker. Shook the shaker, for about 20 seconds. Removed glasses from the freezer, put olive into one glass, then poured the Martini. Upon having the first sip, above mentioned total ignorance of what a real Martini Dry tastes like kicked in and I quickly had to add another two parts of Vermouth to the mixture. Yeah, yeah, I know, putting it in afterwards totally destroys the whole procedure and will be punished by cutting out your taste-buds, but hey, I live to learn. So that was the first real Martini we ever had. After the first few sips, my girlfriend and I decided that even though it’s quite an acquired taste, we do like it. Next time will see the adding of sweet Vermouth instead of the dry, French one.